5 star ratings on several popuar wedding web sites. 6.22.18 - Hi Linda , You did a great job at our cermony . Thank you so much . Michael and Lauren. 6.17.18 . Hi Linda , We got so many compliments on our ceremony . Many said how unique it was . Thanks for everything. It was a beautiful day. Lauren and Matthew . Thank you linda so very much for braving the cold for us ! Our ceremony at Sunset beach was perfect for our renewal. We will see you again in 5 years. Maybe on that ferris wheel ! We are so very thankful for the care and attention to detail that Jim Moore gave to us on our special day. We were more than lucky that he was available for a last-minute, Saturday afternoon wedding. 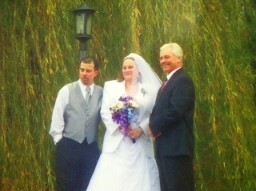 Jim personalized the ceremony to match our story, and it truly brought tears to my eyes. He was super detailed about whole process, from obtaining a marriage license to the steps we’d take during the ceremony, which we appreciated and very much needed. He made our day extraordinary and memorable, and we can’t thank him enough! Thank you for a fabulous wedding ceremony-it couldn’t have worked any better! The day wound up being beautiful for it! Thank you Linda. We are very happy with your service. Ray and Biky. Thank you again for helping with me with the 'secrets' and ensuring Ashley and Mattie had a wonderful wedding! The best to you always and will promise to send a photo once they are all collected. We absolutely had the time of our life! Thank you so much for marrying us. We got so many compliments about how beautiful the ceremony was. My parents loved the way you tied in the beach. Everything was just perfect! Thank you again. Thank you again .You made our day so perfect. Amazing how perfect it was. Hopefully next year we can get together for dinner when we come back to town . Hi Linda: Thank you for the license information . We received many compliments about you . August 2014 : Hi Linda : I just wanted to thank you again for being our wedding officiant. We loved having you as a part of our ceremony and it was perfect. We got so many compliments from our guests about how beautiful it was. I know it has already been a few months, but we all just got together yesterday to watch our video. We talked again about how great it was so I just wanted to let you know. I've also put out a couple reviews on a few websites about how happy we were to have you! 9/15/14 " I'd also like to thank you from the bottom of my heart for how helpful you've been! Most people do things for the money but I can tell by how attentive and helpful you've been you truly care about making the wedding truly special! Josh "
6/20/15 .Thank you sooo much! You were right, it doesn't rain on your weddings!!! It was sunny all throughout! Everybody loved the ceremony they thought it was very sweet, intimate, and personal. I was also told you took care of the bridal party and guided them on what to do and where to position themselves. Please keep in touch, and yes we will send you a picture!!! Once again, thank you for being a part of the happiest day of our lives! 11/1/14 Thank you so much for a wonderful ceremony at our wedding at the Carriage House . It truly was a perfect day. It went even better than we imagined. Thank you for being a part of it. 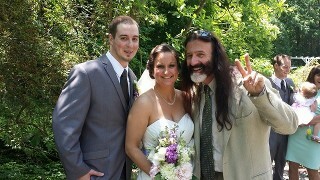 I will be attaching some of the ceremony pics for you. 10/20/14 " Hi Linda. We wanted to take a few minutes to thank you so much for everything you did since the first day we contacted you. Thank you for your patience and for answering all of our questions. We couldn't have asked for a better officiant. Sorry that the weather finally didn't work in our favor, but I did hear it's good luck if it rains on your wedding day. Again, thank you so much. Fabiola and Maria "
Thank you so much Linda for saving our wedding ! You jumped up and ran to our rehearsal with an hours notice, when that person." Internet minister " who was recommended by an co worker stood us up at the last possible second! The next day at the wedding you read my ceremony just as we had already planned it. I was afraid when you stepped in we would have to use one you wanted to read,,but you were so awesome to say it was no problem to use the one we already had. ! I don't know what we would have done if you were not available that day ! You really came through for us and your price was more reasonable than the other person too! We are eternally grateful. My family helped us plan our wedding for many months . Our wedding turned out perfect! 250 guests and a 8 piece band would have been standing around and eating to just have a party had you not been our super hero.. You are not just an officiant you are forever our WONDER WOMAN! thank , you thank you , thank you! Hello Linda: Sandra and I are so happy with the ceremony you performed for us. You made us feel very comfortable from the first moment we spoke on the phone. The ceremony was exactly how we wanted it to be. We thank you for letting us put our own idea's in it. We certainly will recommend you to other members of our community! Warm regards, Theresa and Sandra. From the first time we spoke on the phone to the end of the ceremony, you were absolutely awesome to work with. Very helpful and supportive! Thank you again and again. You really made that moment of our lives even more special. Thank you again for everything- all worked out perfect! We don't have too many pics since we did not have a photographer, but this is the best shot we have of the ceremony. 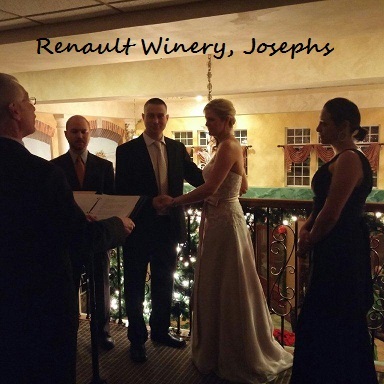 If you ever need any referrals or anything else- please don't hesitate to contact us- you were great to work with and I am very appreciative that you were able to accommodate us for NYE at Renault . Thank you so much for making our ceremony so special. You are awesome! It was so nice of you to come to the bridal room and help my girls with their dresses and sewing the loose hook on my gown! Over and above the call of duty. We loved our sand ceremony. Thanks for bringing everything to the wedding site. 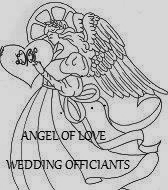 We will definately recommend you to any of our friends needing an officiant. 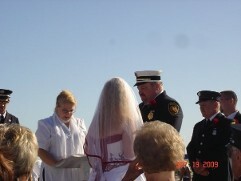 "Memories : When my husband first came up with this firefighter destination wedding in beautiful Cape May during the firefighter's convention, I thought he was crazy.....how would I make all the arrangements long distance from Sussex County! I was very apprehensive about it! 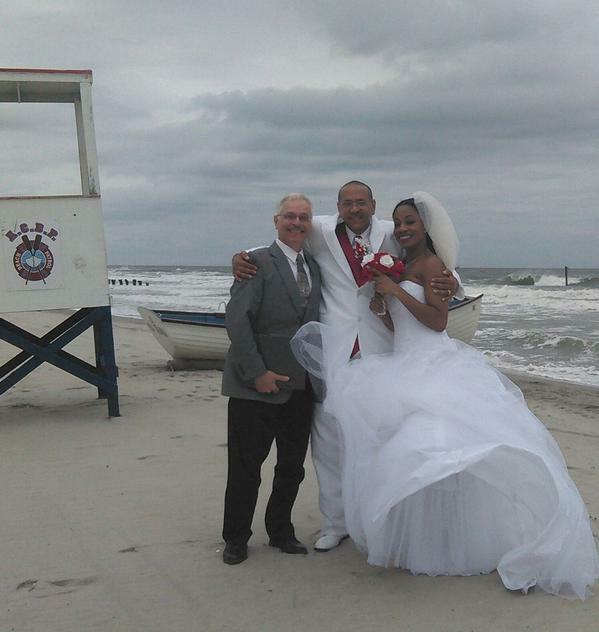 That was until I found Linda Officiant Cape May! Linda was so confident and very creative as well as experienced. She had so many great suggestions and help tremdously. We took a fabulus day and made it last an entire weekend from having our rehersal in the dark on the side street next to the beautiful Chalfonte Hotel with a bunch of crazy kids and a very exhausted bride and groom to a beautfiul ceremony on the beach in perfect weather to a evacation of the hotel for a small kitchen fire!! Even some very special photo opps with the great guys on the dept. Linda was so patient and helpful letting me have several different ceremonies to include all the children! From the Rose Ceremony to the hand tying to the sand jar....It was just a fabuous weekend that everyone is still talking about .....final note: Most brides would say they didn't enjoy the stressful planning as much as the wedding itself but I say I would do it over and over! We have such terrific memories to last a life time!! Thanks Linda for all you have done and I am so happy we see each other on our annual convention trip to cape may county!!! love you JImmy & Marla Sheridan xoxo"
We can't thank you enough for the wonderful job and attention you paid to our wedding ceremony. You were always available to talk when we had many questions. and really helped us a lot..Our wedding ceremony was awesome. It was a great day! Thank you so much. Adam and Barb. Thanks Jim ..I appreciate all your help and professionalism. You made the day simple and meaningful which is exactly what we desired. Take care ! extraordinary. Thank you deeply. We now feel as if we always knew you. Yes,, you will be getting a remembrance of the event in the near future. all you and your family desires. Most fondly, Len and Ernie. Hello again Jim and Happy New Year! 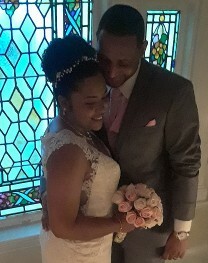 We just wanted to take a moment to say thank you so much for making our wedding ceremony absolutely memorable and special. Everything was wonderful: the Cape May lighthouse, the keepers, the ceremony you performed for us....everything. We also want to thank you for being so gracious and climbing all of those stairs just for us, making us laugh, and being patient while we figured out New Jersey's complex system so that this all managed to happen. We couldn't be more grateful and we will never forget you. You've helped to make our dream come true. Thank you, thank you a million times. You are absolutely amazing.